Woody Guthrie's 'Note Of Hope' From Beyond The Grave Note of Hope: A Celebration of Woody Guthrie features 13 artists working with Guthrie's lyrics. 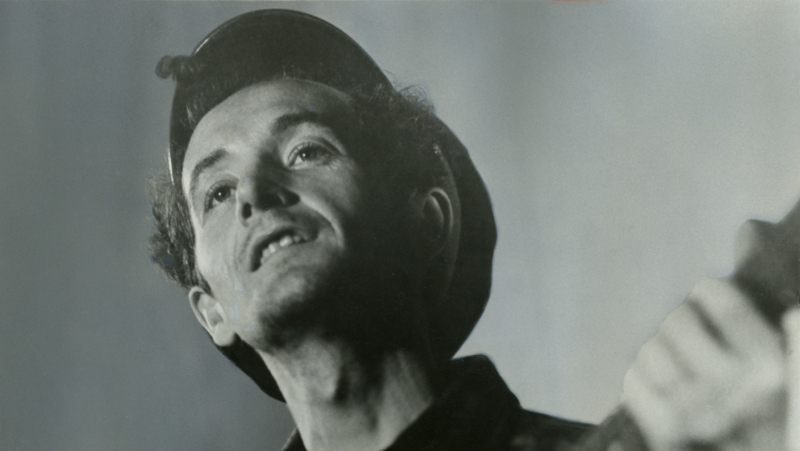 When Woody Guthrie died in 1967, he left behind an enormous cache of unpublished lyrics and prose, which has resulted in an exceptionally rich posthumous career. Bob Dylan, who should know, has written of Guthrie: "He was so poetic and tough and rhythmic. There was so much intensity, and his voice was like a stiletto." Though I probably shouldn't admit it, I rarely listen to Woody Guthrie for pleasure. I'd rather hear Dylan sing Guthrie's songs — or, as it turns out, a lot of other people. Note of Hope: A Celebration of Woody Guthrie is the culmination of a 13-year dream for bassist Rob Wasserman and Woody's daughter, Nora Guthrie. If you don't recall a Woody song called "Wild Card in the Hole," that's because jazz singer Madeleine Peyroux wrote the music for a lyric Nora chose for her. Note of Hope is the sixth album based entirely on writing that came to light after Guthrie's death, including two by Billy Bragg & Wilco, two by The Klezmatics and one by Jonatha Brooke. These posthumous collaborations have no parallel in my experience. For more than a decade, they've been where I've gone when I felt like communing with the spirit of Woody Guthrie. I still play every one, and now Rob Wasserman has given me another. Wasserman is more than comfortable backing Lou Reed's sprechgesang, Michael Franti's rapping, and three spoken-word prose tracks by Ani DiFranco, Pete Seeger and the late Studs Terkel. Most of Note of Hope's guests are left-identified, but the texts they interpret aren't very ideological — Guthrie's playfulness, sexuality and inquisitive mind are front and center. And, though rhythm does predominate, Jackson Browne's 15-minute finale is an unrelentingly strophic meditation on the night he met his wife Marjorie. Some may call it overlong. I'm not even a Jackson Browne fan, but I must say it is hypnotic.